FOR NEW MEMBERS ONLY. Limited time offer valid from 12:01 ET 4/15/11 through 11:59 p.m. ET 12/31/17 (the “Offer Period”). Offer open to legal residents of the fifty (50) United States and D.C. Individuals must be aged ten (10) or under at time of enrollment to qualify. Individuals (and their parent(s)/legal guardian(s)) must agree to adhere to the Constitution, Bylaws and Rules and Regulations of the USTA (available on www.usta.com). Allow 4-6 weeks for membership to become active. Regular price for one-year junior membership: $20. Terms of membership and benefits subject to change in the USTA’s sole discretion. USTA Membership is not transferable. 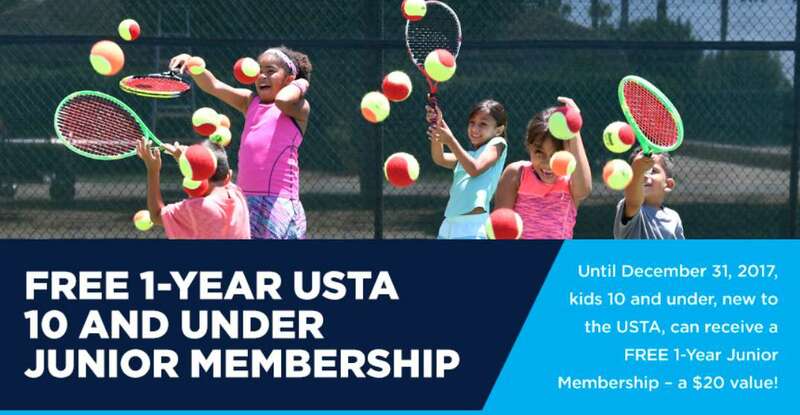 Visit www.usta.com/terms for membership terms and conditions. Offer sponsored by United States Tennis Association Incorporated, 70 West Red Oak Lane, White Plains, NY 10604. © 2017 United States Tennis Association Incorporated, all rights reserved.